I’ve got a lot of help around here when it comes to Christmas gifts. I ask them, and the ideas flow! Today I actually wrote some of these down because I didn’t want to forget them. Here it is: the ultimate gift shopping list as assembled for me, by Chloe. An idea which was later contributed by Daphne for them all was “something to match our toothbrushes.” It looks to be a pretty good Christmas around here! The best thing about this list is Chloe’s own personal wish for a Flower. And some Grass. 3 year old: I want presents! 5 year old: For me, I want a double barrel riffle gun! [pensive pause] He’ll want a bunch of bananas. “Something to match our toothbrushes.” Too funny! Love it! And what? 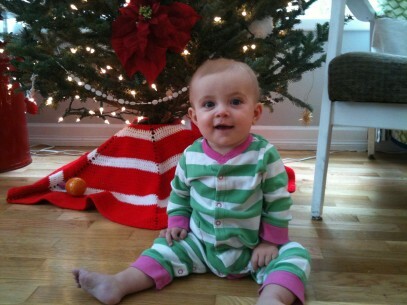 Little Blaire is sitting up! Wasn’t she born just the other day? My, time flies. What a coincidence! My nearly-five-year old wants a baby chicken for his birthday, just a few days before Christmas. He also wants a “real, live pony.” At that rate we’d have a zoo by the time he’s 6! Now there’s contentment in the simple things of life. And what a darling little Blaire!